Frontiers Music Srl has announced the release of JORN's brand new studio album, entitled Life On Death Road, on June 2, 2017. Easily one of the greatest rock singers of the 21st century, Norway's very own giant Viking warrior Jorn Lande's vocals are resoundingly strong once again on his ninth original studio album, Life on Death Road! This new album sees Lande attacking the microphone with rejuvenated vigor, accompanied by a new band and a bigger and stronger sound. Life On Death Road took several months of hard work for the songwriting vision to come together. Jorn needed to take the music to a new level to push the concept of the band further than it has ever gone before. The result is a record that is deep, strong, full of groove and powerful with anthemic songs aplenty! Songs like "Man Of The 80's", "Love Is The Remedy", "Life On Death Road", "Insoluble Maze (Dreams In The Blindness)", and "The Slippery Slope (Hangman's Rope)" capture the essence of Jorn as a singer, songwriter and lyricist. Jorn says, "It's easily one of the best albums I've ever recorded. This was all about putting the right people together for the right result, and about taking the necessary time to work more thoroughly and in depth with the material we chose for the album. The older I get, the more I feel it is necessary to listen to my heart and look for that genuine and honest feeling that made me take interest in music in the first place. Back in the 70's and early 80's when I grew up, people and music were more free and so the presence of feeling and soul came more naturally and was expected from an artist or a band. This is the energy and craftmanship we've been looking for, but still keeping a pulse on the modern times we live in. Life On Death Road is an original album that is pretty much summing up the last 40-50 years of rock and metal and has become a hybrid modern heavy rock album without losing those tasty elements of a good aged wine. Regardless, we're all products of our time, and the feeling, soul and symbioses we've achieved for this album is a rarity in today's music world, so in that sense this album is a true old school sailors' "tall ship adventure". From start to finish it took us nearly three years to finalize and I'm really proud to say that this album is the proof that classic albums can still be made." The album also marks the debut of a new lineup of very experienced and gifted musicians around the Norwegian singer. On bass is Mat Sinner (PRIMAL FEAR, SINNER, KISKE/SOMERVILLE) who needs virtually no introduction to European heavy metal fanatics. On keyboards and production is Alessandro Del Vecchio (HARDLINE, REVOLUTION SAINTS), who already joined JORN for the recording of his last covers album, Heavy Rock Radio and was the glue that helped Jorn to create the feel and the direction for the new album. Francesco Iovino (PRIMAL FEAR) is on drums and Alex Beyrodt (PRIMAL FEAR, VOODOO CIRCLE) handles guitar. Truly a recipe for a roaring success! Jorn had no desire to do "just another" JORN record. The aim was to do the best record possible and it took almost two years of writing, arranging, and producing before wrapping this all up. The performances are thunderous across the board and you can hear the urgency of these songs in Jorn's singing! Jorn's catalogue is getting too long to include in brief overviews and his innovative and creative skills as a vocalist and music visionary have led to him selling millions of albums worldwide while being a frequent entrant on sales charts around the world including Billboard. Worth a mention here though are his years fronting MASTERPLAN, whom he recorded three albums with. He has also recently collaborated with the world's biggest online gaming company, Riot Games, providing vocals for the virtual band PENTAKILL in the game League Of Legends. 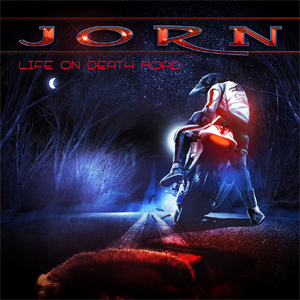 Claimed to be the biggest selling Norwegian musical export since the pop band A-HA, Jorn continues his rock crusade and there are no signs of him slowing down and Life On Death Road is a magnificent testament to his abilities! "Hammered To The Cross (The Business)"
"Insoluble Maze (Dreams In The Blindness)"
"The Slippery Slope (Hangman's Rope)"